Securis franchise owners George Parks and Daniel Dodd, who own and operate the data destruction and electronics recycling facility in Baltimore, Maryland were interviewed by Technical.ly Baltimore. In the article, Parks discusses hard drive destruction methods, company mission, and the importance of data security. Securis’ Baltimore, MD location performs projects for The Social Security Administration, Aberdeen Proving Ground, and provides work under contract for the large military contractor General Dynamics. With 50 million tons of e-waste being generated per year, and only 15% of it being recycled, Parks and Dodd are providing a much-needed service to public and private sector companies and agencies. 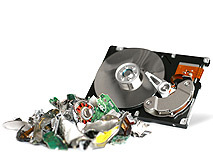 Parks’ and Dodd’s Securis franchise provides data destruction and computer recycling to Baltimore City, Baltimore County, Harford County and Cecil County, Dundalk, Middle River, Towson, Edgewood, Belair, Essex, Pikesville, Woodlawn, Milford Mill, and more. Read the full Technical.ly article.